Can you find our treasure? 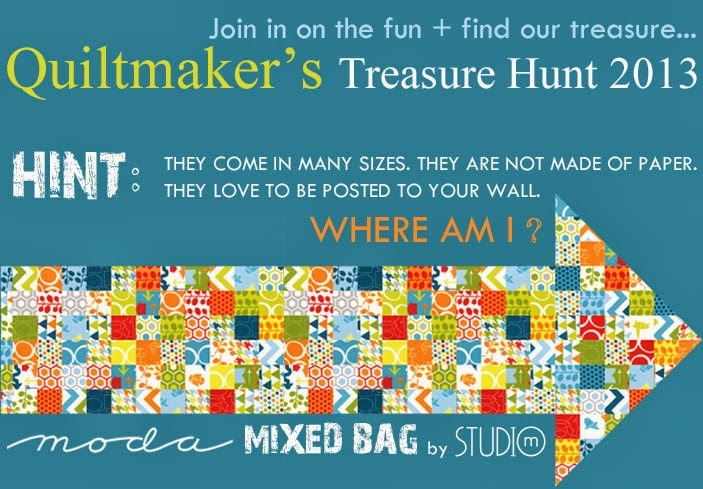 Use our hint above and see if you can locate our Quiltmaker’s Treasure Hunt Logo on our main website to enter to win one of the many fabulous prizes. 1 of 25–Prize packages filled with LOTS of fabric, quilting supplies, thread and more—all from our generous Treasure Hunt sponsors. • Search through the ads in Quiltmaker’s Nov/Dec ’13 issue to find the Treasure Hunt button. • Visit that sponsor’s website and hunt for the button there. • Click the button on their website for an entry form. • Repeat until you have found all 22 buttons and entered the contest each time. Q. Do I have to enter more than once? A. No, but each entry gives you one more shot at winning. Q. How many times can I enter the contest? A. 23 times – once from each participating sponsor’s website and once from QM. Visit each of the participating sponsor’s websites to enter for a chance to win a sit-down long-arm quilting machine package, a feature-filled sewing machine designed for quilters, a complete ironing package, a sewing cabinet or one of twenty-five fantastic prize packages that include LOTS of fabric, quilting supplies, thread, books and more! The contest will be open from 2:00 pm MST on 10/1/13 until 11:59 pm MST on 12/2/13. For more information and official rules, click here. GOOD LUCK!! Previous Previous post: What’s on Your Quilting Bucket List? Next Next post: Layer Cakes and More! I did this Treasure Hunt one year and was I ever sorry! I ended up with so much Spam. The companies put you on their email list without your agreement. I did not mean to insinuate that Moda will send anyone unwanted emails. Let me clarify, I think when you do the Treasure Hunt the default position is to subscribe the participants. I didn’t expect that!